Seldom, the journey is the destination, but the Great Ocean Road fits perfectly in this category. Australia has been one of my dream destinations and I finally ended up on a trip to the continent. Driving through the Great Ocean Road was on the top of my wish list. Ideally, I would have loved to cruise down the 243 kms long highway along the South-West coastline of Victoria in a convertible with the top rolled down but had to settle for a coach tour, which in no way diminished the beauty of the scenic coastline. Our journey started at 7 am from Melbourne which was shrouded in the thick fog. 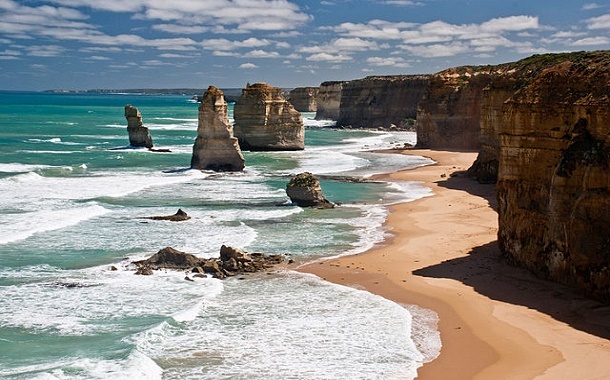 Great Ocean Road, billed as one of the most scenic drives in the world is a kaleidoscope of breathtaking vistas ranging from amazing surf sprayed beaches to bays and inlets, hills, rocky outcrops, gigantic cliff faces and lush rain-forest. The Great Ocean Road begins from Torquay, South of Geelong up to Allansford, East of Warrnambool and offers some of the most awe-inspiring rock formations, on the coast and towering out of the sea - the Gibson Steps, the Twelve Apostles, the Loch Ard Gorge, The Arch, the London Bridge and the Grotto are few of them. 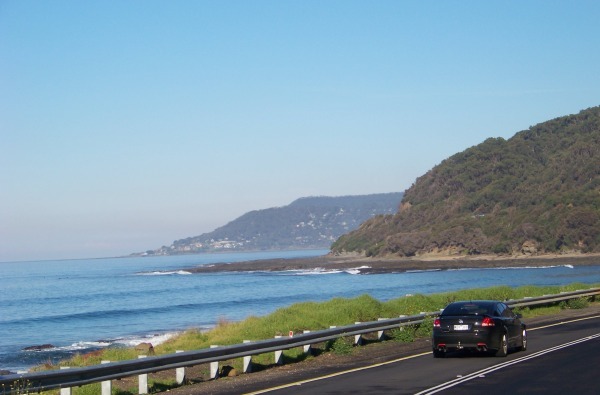 There are multiple options to experience the Great Ocean Road-cars, bikes, walking etc. and on the road that keeps winding on and on up and down along endless sandy and rocky beaches, green hills and narrow valleys also beckon to be explored. Each turn is a discovery of sorts. The drive through Great Ocean Road can be both, either a short day trip to see the world famous Twelve Apostles or a leisurely affair spanning couple of days with stops at multiple coastal towns, national parks, beaches, tourist attractions and anything off the road that catches your fancy. The Great Ocean Road is a three hour drive from Melbourne city centre and there are convenient signages. Our coach tour to experience the Great Ocean Road commenced from Geelong, passing through multiple small coastal towns and surfing beaches. Torquay marks the start of the Road and our first stop was Bells Beach, billed as one of the best beaches in the world for surfing. Despite the cold temperature and lack of waves, I was surprised to see a large gathering of `surf dudes’ out in the ocean waiting patiently to ride the next big wave. After a short coffee break, we moved further to Koala Cove and walked around the grounds observing the lazy Koalas on tree tops. Initial enthusiasm to capture on camera, the cute and so cuddly creatures from all possible angles gave away quickly on account of no action! However, a large cluster of colourful Crimson Rosella birds forced my camera to run out of battery. The photographic session ended in a standoff as a Freckled Duck resting underneath our coach who refused to budge. Back on the road again, our next pit stop was the Cape Patton Lookout for some `Kodak moments.’ I was stunned by the clear and spectacular view of Apollo Bay and Skenes Creek. After a quick bite at Apollo Bay we hit the Road once again, with my appetite still keen on more curves and views. Our next awe inspiring sight, Twelve Apostles was the key highlight of the road trip. These giant rock stacks emerging off shore East of Port Campbell are world famous and attract lot of tourists. Formed by the erosion of the original coastline millions of years ago, the cliff is still being eroded at a rate of about two centimetres each year, thus it’s likely to form more 'Apostles' from the other rocky headlands that line the Victorian coastline. To get a picture perfect view, one should experience either sunrise or sunset at this spot. Both offer impressive views of the Twelve Apostles changing colours and hues. At dawn, the Apostles emerge from dark silhouettes to attain a reddish-orange tinge and change palette to a bright sandy yellow. At sunset one gets to view the light and shadow play in reverse order. While the drive is an unforgettable experience, viewing the Apostles from a helicopter is exhilarating. The helicopter ride offers a bird's eye view of the stunning South West coastline along with the giant Apostles are certainly a must do. For those craving adrenalin high could go for tandem skydives. A qualified professional will supervise your jump that starts with a free fall for up to a minute at a speed of 200 kms per hour and ends with a gentle landing. The view of the coastline and the Apostles as you plummet to the earth is awesome if you can keep your eyes open. One can also opt for authentic vintage open cockpit Tiger Moth flight over the area. I opted for the ten minutes helicopter ride over the Apostles. The ride cost anywhere between USD 70 – USD 90 depending on season and holidays. My ten minutes ride was worth the money as I got the co-pilot seat, the best possible one for the spectacular aerial view of Twelve Apostles, Loch Ard Gorge, Bakers Oven, Sentinel Rock and Port Campbell. From the Twelve Apostles, we headed back to the dazzling city lights of Melbourne. The images of the long winding road, waves lashing the shore and the stunning natural formations keep surfacing in my mind even today. The memory of the Great Ocean Road drive refreshes my senses each time I am feeling low in Mumbai. It is indeed true when people say ‘There is nothing like Australia’. 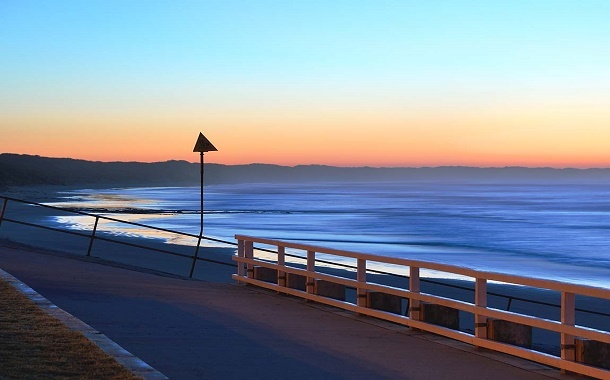 Bet this post makes you want to get your own Australian tour packages and set off on your very own Australian holiday.